Last week I put my bedroom furniture under the knife… like open heart surgery kind of knife. If you missed my nasty bedroom where I introduced the 90’s pine nightmare you can check it out here. Something HAD to be done, I couldn’t live with the boring lines and the dreadful yellow pine for one minute longer- yuck. 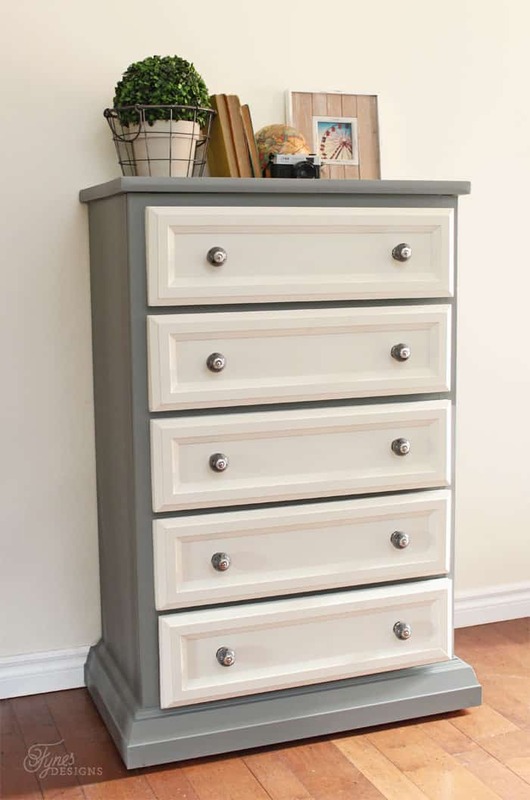 I teamed up with Metrie to bring you this tall dresser makeover tutorial that would take my furniture from dreadful to dreamy! Can you believe all it took was a bit of trim work and paint to bring this furniture piece around! 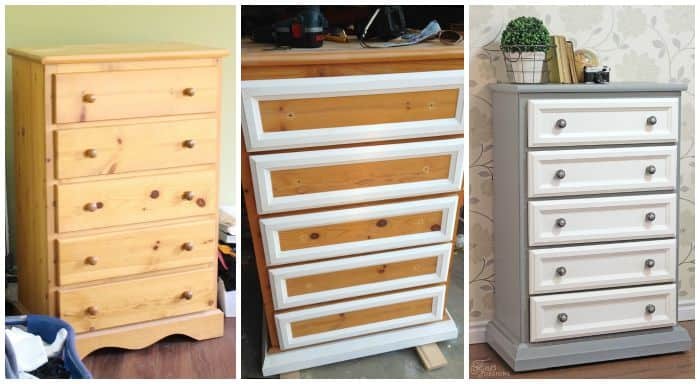 This dresser makeover was a great project for a first time working with trim; let me show you a few basics. First thing, you’ll want to remove the dresser drawers and insure the piece is in good condition structurally (fixing any problem areas) before you begin adding trim. Measure the drawer fronts from the outer most edges to determine your first cut. I can’t stress enough the measure twice, cut once rule with this project. After you cut one piece for each of the length and width of the drawer front you can then place one piece on top of each other to ensure you are cutting the same each time. I found this method easier than trying to get the tape measure to teeter on the angled cut. Before cutting, bring the tip of your blade down to see that it is square with the edge of your pencil mark, not on top of it. You want the pencil mark on the side of the trim you want to cut. 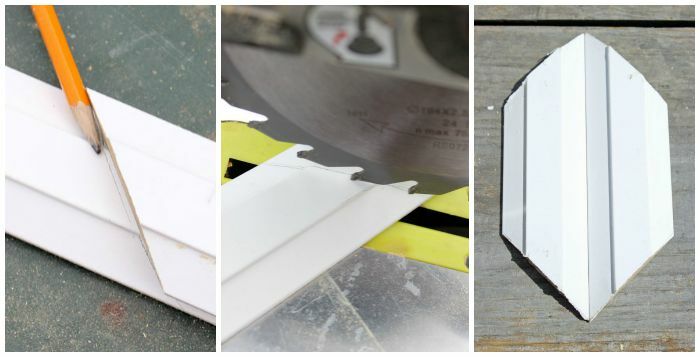 You can insure your trim pieces are cut exactly the same by putting them back to back. The lines of the trim will not line up if you’re off by even a hair. Accurate cuts are the key to having your drawer fronts line up, cutting trim is definitely not a job you want to rush through. Now you’re ready to add the trim to the drawer fronts. First line up your pieces to be sure everything is square and will fit together properly. Then glue in place and nail down in each corner. 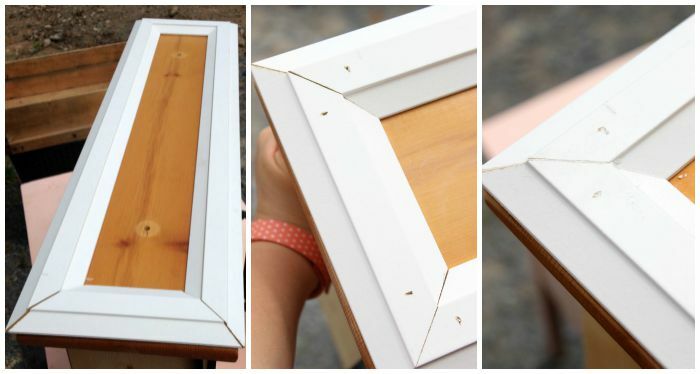 Then you can fill in the nail holes and cracks, allow to dry and sand smooth. Now you’re ready to paint! Because my furniture piece is pine, I first primed the entire thing with BIN to seal the knots. However if your dresser is another wood, you can give a light sanding and skip the priming. 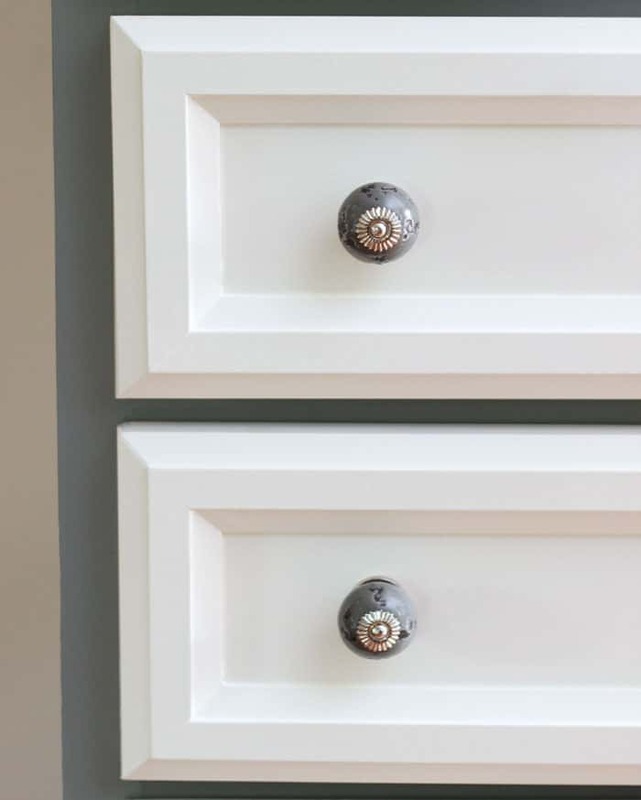 To give my tall dresser a smooth professional finish I used the Home Right Finish Max paint sprayer. 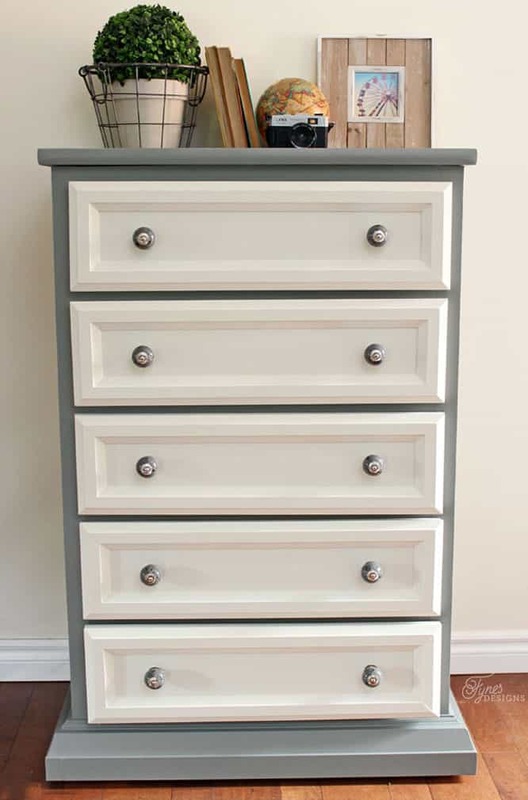 When painting is finished add your hardware to complete your dresser makeover. 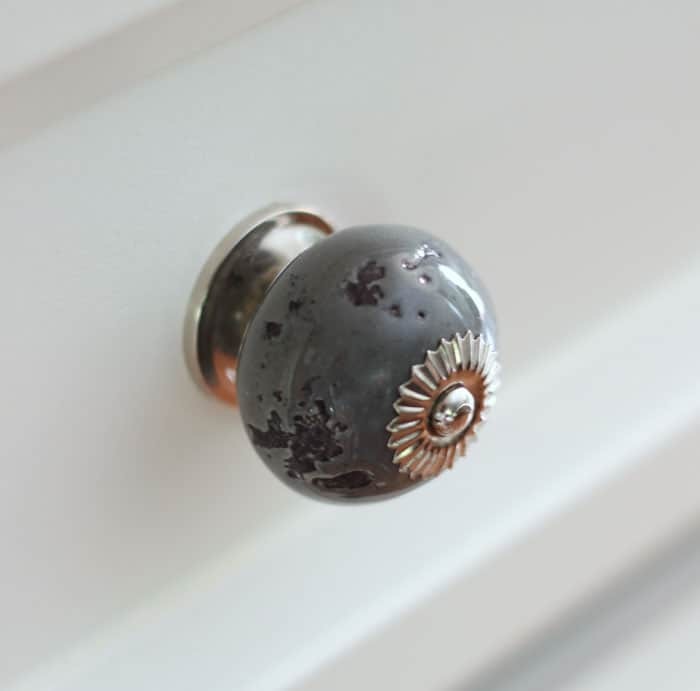 I chose a Grey Ceramic knob with aged chips from D. Lawless Hardware. I love how bold and visulally heavy they are for this piece. Half way between masculine and feminine. Viola finished! I just can’t believe how a bit of trim work and paint can take a boring outdated piece and bring it back to life! Metrie has so many options when it comes to trim. You can even take a Style Quiz if you don’t know what style trim would suit your home and taste best. Then you can use the Room Styler to give different combinations of trim a try before you buy- genius! I really can’t wait to share what I did with the bed! What do you think, do you have a piece of furniture that could be easily recreated just by adding some Metire trim? Disclosure: I partnered with Metrie to create this project, all ideas and opinions are 100% my own. Holy guacamole! I love this! I just checked out the site for the trim product – very chic. You wouldn’t even know this was the same piece of furniture! My daughter has a whole set of this pine furniture. You’re giving us some great ideas! I absolutely love the rustic look of that hardware against the crisp, clean look of the dresser. So pretty! That is so gorgeous!! 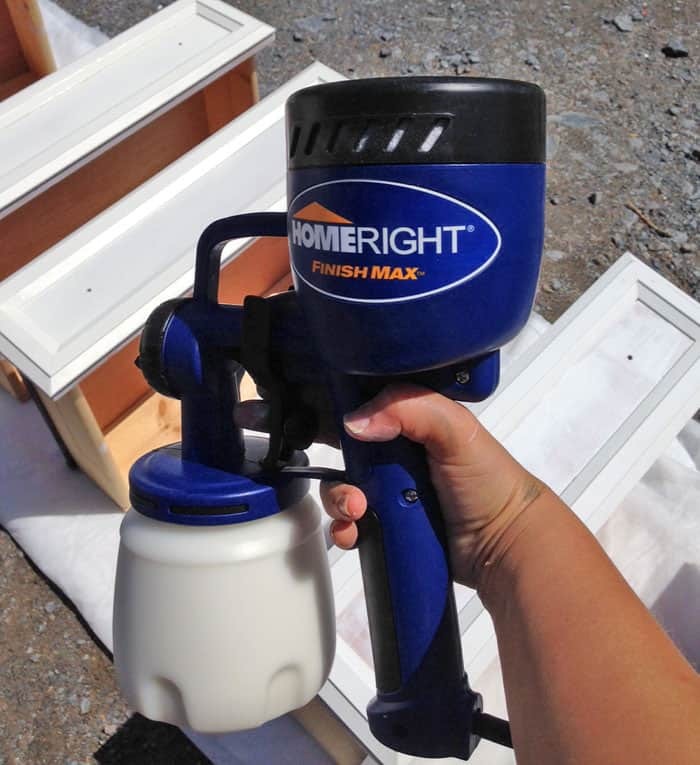 I want one of the Home Right sprayers! 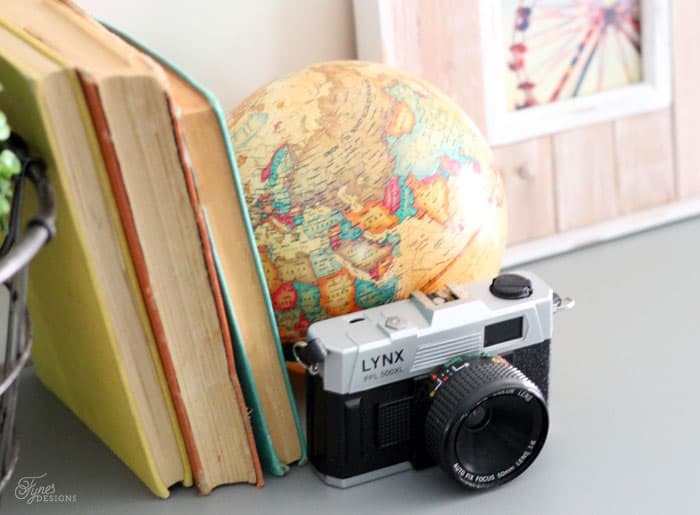 What a beautiful upcycle! Wow, what a transformation! It looks totally different. What a difference a little trim makes! Great job! It looks like a million bucks! Beautiful! And I especially LOVE those knobs! This turned out great! I love the color choices. Love this makeover, you definitely made it more up do date with all your changes. Your makeover is fantastic! What a difference. The colors you chose are lovely. Thanks for sharing your awesome project on Snickerdoodle Sunday. I Will be repainting my bedroom set (it was originally my grandmothers). So thank you for the fresh ideas. Lois. Wow, what a great transformation. Thanks for much for the tutorial, can’t wait to try this! Love the new look. I ‘ll be repainting my bedroom set soon, thanks for the ideas. Gorgeous! 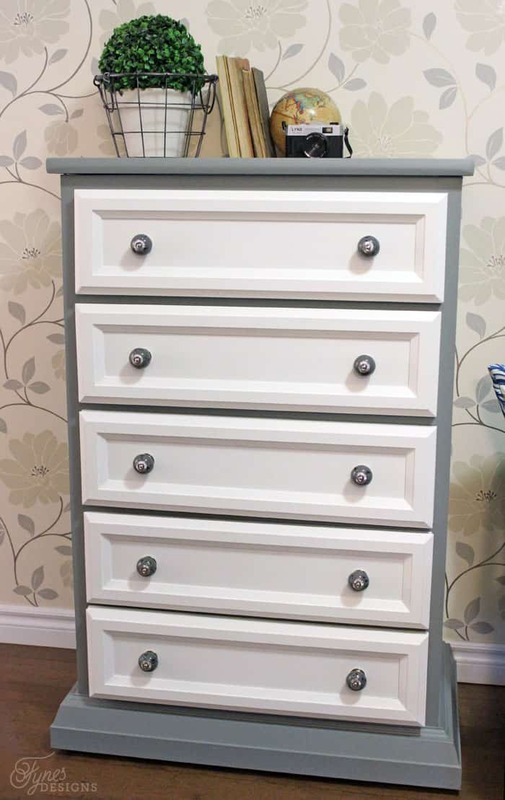 Love how this turned out and I am obsessed with those dresser knobs! Thanks for sharing! me too!! They are masculine and feminine all in one! This looks amazing! Love the final product. I love your dresser. It’s amazing what you can do with a little moulding and a little paint…pinned. I know! i amazed myself a little! I love this project, you did amazing! That wall paper is very neat too! I’m subscribing! Thanks for visiting Carole, welcome aboard! If you hadn’t shown how you how you added on the trim, I would not have guessed this being the same dresser at all. Hi there! Gorgeous transformation and I have just the piece to try with your perfect trim recommendation. I have an odd question- do you happen to have the wallpaper information that is in your final photo of your piece? Its beyond lovely! Thank you for any help!